Since 1983, Sport Chutes has distributed and manufactured unique watersports equipment for the leisure and commercial marketplace worldwide. Specifically, we manufacture and distribute: ascending parasails for the boat; parasail accessories and related equipment; banner tow chutes for advertising; flags; banners; inflatable watersleds to be towed by the boat; commercial parasail winchboats and related gear. We also offer custom sewing and repairs to all brands of chutes. All of our products have been used extensively in the vigorous commercial environment for decades. This means, when you buy from Sport Chutes, you have years of our excellent reputation behind you. However, even with the information you find in this site, we realize it is impossible to thoroughly answer your every question, so we encourage your call. Our pledge to you is to offer full advice to assist in your learning about these sports. We will be glad to visit with you at length to completely answer your questions and provide guidance and recommendations in your selection. We have extensive experience in the business and would be delighted to earn your trust. We hope you enjoy our sport and operate safely. Thank you for visiting our international web site. Sport Chutes was founded by me in 1983 because I loved boating and wanted to bring the wonderful fun sport of parasailing to the average family. Over the years, I have been privileged to introduce thousands of people to the sport so they, like you, can experience the thrill and serenity of flying freely through the air. Parasailing creates lots of smiles and happy faces and I recommended everyone try it. I have also worked very hard to offer commercial operators a “one stop shop” for all of their commercial parasail chute and equipment needs with chutes, equipment and winchboats we proudly build here in the USA. Further, we are the oldest supplier of this gear under continuous operation since 1983. We continually look to improve our products so your feedback is very important to us, whether you are a first timer, a pleasure seeker, or a seasoned professional operating commercially, Sport Chutes offers the world’s largest range of products to satisfy your needs. Our chutes are made by us, here in Dallas Texas with premium U.S. materials and components to insure you have the most technically up to date products available. Our products are always under research and development and your feedback is very important. We welcome your comments with open arms and believe the best products are a result of open dialogue between the factory and the user. Sport Chutes is truly the pioneer in the U.S. industry. We have been instrumental in growing the industry both leisurely and commercially. We take pride in offering the best manufactured products in the world today. When quality counts, come to us. Our pledge is that we will work very hard to earn your trust and business. 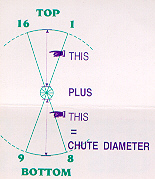 Sport Chutes Over Texas, Inc.